PTA Updates 12/13/15! 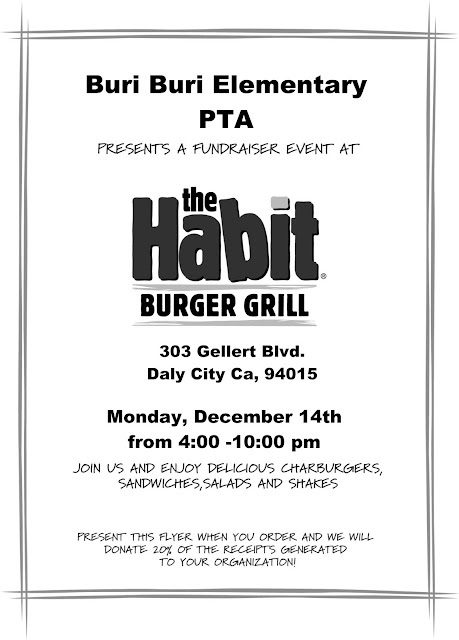 The Habit Restaurant Night Monday 12/14 and more! We hope all are enjoying the holiday season :) Here are a few upcoming PTA events. Please mark your calendars. We hope all will attend. PTA Meeting Jan 7, 2016 at 6:30pm in the MUR. Dinner and babysitting provided! Soul Shoppe is working with our students this year to present multiple assemblies focused on bullying and character building. If you are concerned with bullying at school, please attend this meeting. We will have babysitting sign-ups on our website during the winter break. We'll also talk about our upcoming spring events, LEAP classes and construction. See you there! Thank you to those of you who joined the PTA this year. 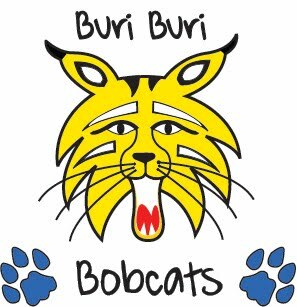 Buri Buri has more PTA members than any other school in the district! Mrs. Rivera's 5th grade class won the membership contest with 96% of her students having family member in the PTA. They won $250 to spend on an event of their choosing. Mrs. Rivera says that she's planning a field trip for her class. It's not too late to join the PTA. It's only $10 and dues supports our PTA here at Buri and the larger state PTA as well. South City Carwash Coloring Contest Winners! Congrats to all the winners! Your prizes will be delivered to classes Monday or Tuesday this week. If you haven't picked up your Christmas tree yet, head over to the South City Carwash tree lot. Tell them we sent you and Buri will get 15% of your purchase. We have lots of exciting LEAP classes ready for the new year. We're going to have online registration again on January 8th. Time and more details TBA. We will have 2 classes of Minecraft and we're looking to add some new classes like cooking and soccer to teach STEM. Finally please use our Amazon link for your holiday shopping! Just click HERE to go to amazon and we will get a portion of the advertising revenue without costing you anything extra. Thank you! Happy Winter Break!! Here is a list of all the winners from the Mixed Bag drawing. People were given 1 entry for each 3 items sold. The top seller was Emelina Pelayo and she won a $150 target gift card plus all of the Mixed Bag prizes including a tablet and 3-D pen! Prizes will be passed out Friday!